We know that food is an important part of your experience at every event that you attend at Bliss Restaurant. An excellent catering service can take an event from being just good to being great. Our world-class chefs have experience creating a variety of menus for every unique event that we host at Bliss Restaurant. 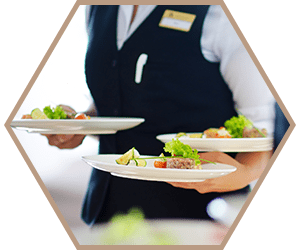 Whether you want traditional American cuisine, Mediterranean, Middle Eastern, Mexican, or any other type of food at one of intimate banquet halls in Los Angeles, our in-house catering team will design a menu with you that will take your taste buds for a ride! Perhaps our most popular dining-style option is family style. This dining option makes you feel right at home as our waiters bring delicious trays of food right to your table. Each guest can pick and choose what they’d like to eat and enjoy as much as they’d wish! Our generous portions will ensure none of your guests leave hungry. If you’re aiming for a different feel for your event, our table service dining option might add the touch of elegance you were looking for. Each guest will receive their own specific plate delivered to their seat. This option is popular as it allows for each guest to know exactly what they’ll be eating. Our buffet-style dining service will allow each guest to eat at their own pace! Our in-house catering service will work with you to create the perfect spread exactly to your taste. Maybe some of your guests are busy dancing and celebrating away and would prefer to eat a little later. Our buffet-style service affords them the opportunity to eat at a time that suits them best! Take your event to another level by offering your guests one of our specialty tables! 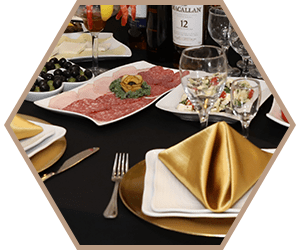 Our specialty tables can really enhance the vibe of your event by giving your guests a unique option for savory snacks or to satisfy their sweet tooth. Have a specific theme for your event? Create a special dessert table that matches your theme! We can put you in contact with one of our trusted vendors to design a specialty table that fits your next special event.